Draft: 2013, Seattle Mariners, 3rd rd. Graduated from Garibaldi Secondary School...Named 2013 Rawlings 3rd Team All-American and First Team All-Region (Canada & Puerto Rico Region)...Played for the Canadian Junior National Team in 2012...Member of Team British Columbia that played in the 2012 Canada Cup Tournament in London, Ontario, Canada and earned MVP of the Gold Medal Game...His father, Terry, is a former Mr. Canada, winning the national body building title in 1975...Attended Major League Baseball's Rookie Career Development Program after the 2017 season...Grew up playing the piano...Resides in Burnaby, British Columbia, Canada. Named the Cardinals Minor League Player of the Year...Recognized as 2018 Pacific Coast League Post-Season All-Star with teammate RHP Dakota Hudson...Baseball America 2nd team all-Triple A...Was recalled from Memphis (AAA) on 4/19 and made his Major League debut at Wrigley Field vs. CHI (4/19) as a pinch-hitter vs. Jon Lester and struck out...Recorded his first MLB RBI on a sac fly scoring Yadier Molina vs. CIN (4/21)...Recorded his first Major League hit off Yacksel Rios vs. PHI (5/18) in his 7th career MLB game...Became the first Cardinals rookie to homer in 3 straight games (5/19-21) since Paul DeJong (7/7-9/17) and was the 3rd MLB rookie to pull off the feat in 2018 (Ohtani 4/3-6 & Villanueva 4/14-16)...Hit first MLB home run (solo) off Luis García, to tie game in 6th vs. PHI (5/19)...Ranked 10th among National League rookies with 9 HR's...His nine home runs in his first 61 Major League games ranked 9th most in Cardinals history...Hit 35 home runs between Memphis (26) and St. Louis (9)...Hit his first career walk-off home run and first extra inning home run in the 10th inning vs. SF (9/22) off Mark Melancon...Led the Cardinals with a .523 slugging percentage post All-Star Break...Walked as a pinch-hitter & then hit 3-run HR (#8) on a 3-0 count vs. PIT (9/11)...Averaged a HR/14.44 AB, leading N.L. rookies (100 AB min.) & 2nd in MLB...Homered in consecutive games on four occasions (Last: 8/26-8/28)...Scored a run in four straight games (5/18-5/21)...Hit safely in the six games after his 2nd recall (5/18-23), including 3 home runs...Hit first career pinch-hit home run (#4) to tie game in 8th at LAD (8/22) off Scott Alexander...Missed eight games due to groin inflammation (8/4-13)...Was recalled to St. Louis from Memphis (AAA) five times with the final time on July 31...Recorded his first career pinch-hit single, the eventual game-winning RBI (started 0-8) including a stolen base (#1) vs. COL (8/1)...Canada native batted .311, 26 HR & 63 RBI in 64 games for Memphis (AAA)...Was leading the Pacific Coast League & ranked 2nd in the minors with 26 HR at time of recall...Posted 6 multi-HR games in AAA with a season-high 3 HR vs. Colorado Springs (7/22)...HR by Month: April (6), May (7), June (6), July (7)...Posted 20 games with multiple-RBI. Was acquired by the Cardinals in a trade with the Seattle Mariners on July 21 for LHP Marco Gonzales ... Combined to bat .246 with 31 home runs and 95 RBI over 130 games in Triple-A between Tacoma and Memphis ... His 12 home runs hit with 37 games at Memphis were two shy of ranking in the Top 10 among Cardinals minor leaguers ... Ranked T5th in all of Minor League Baseball with 31 home runs and was 1 of 11 players to hit 30 or more home runs ... Ranked among Pacific Coast League leaders in home runs (31, T-4th), RBI (95, 4th), total bases (247, 5th) and games played (130, 3rd) ... His 60 extra base hits ranked T5th in all of Triple-A ... Recorded 11 RBI in the Pacific Coast League playoffs, the most by any player in the Triple-A postseason ... Posted three games with 5 or more RBI during the season ... Drove in a season-high 7 RBI at Reno, one RBI shy of his career-best ... Hit his fourth career grand slam, coming vs. Reno (6/6) ... Posted three multi-home run games (6/23 at Reno, 7/4 at Reno & 7/20 at Albuquerque) bringing his career total to eight ... Played for Team Canada in the 2017 World Baseball Classic making three starts in left field and recording one hit, a single vs. Colombia (3/11) ... Rated as the No.5 prospect and "Best Power Hitter" in the Cardinals organization by Baseball America. Played in a career-high 130 games with Jackson (AA) ... Named Southern League Most Valuable Player and was a Southern League Mid-Season and Post-Season All-Star ... Named Southern League Player of the Year by Baseball America ... Named to Baseball America's Minor League All-Star Team ... Was 1 of 4 finalists for USA Today's Minor League Player of the Year and 1 of 10 players nominated fo MiLB Offensive Player of the Year ... Led all Mariners minor league players with a career-high 102 RBI ... Led the Southern League in RBI (102), slugging (.508), OPS (.882), extra base hits (54), total bases (256) and intentional walks (4) ... Ranked among Southern League leaders in home runs (24, 2nd), at-bats/home run (20.50, 2nd), on-base percentage (.374, 2nd), batting (.293, 4th), hits (144, 5th), walks (62, 5th), doubles (26, T6th), runs (68, 8th) and games (130, 8th) ... Had multi-home run game at Pensacola (4/23), his 5th career multi-homer game ... Established a career-high with 8 RBI vs. Pensacola (6/8), including a two-out walk-off grand slam, his third career grand slam ... Batted .448 (13-29) with playoff highs for hits (13), runs (7), home runs (3), RBI (9), on-base percentage (.515) and slugging (.828) in the Southern League postseason. Ranked T-2nd in Minor League Baseball with 32 home runs. Was 1 of 7 players to hit 30 home runs in Minor League Baseball. Ranked 3rd in MiLB with 12.72 AB/HR ... California League Post-Season All-Star. • Led the California League in home runs (32), AB/HR (12.72) and tied for first in intentional walks (4) ... Ranked among California League leaders in RBI (87, 6th), on-base percentage (.874, 8th) and extra base hits (55, T8th) ... Led all Mariners minor league players with 87 RBI ... Played in 19 games for Peoria in the Arizona Fall League, batting .292 (21-72) with 3 HR and 14 RBI ... Named to the Arizona Fall League Rising Stars Game, batting 3rd in the order and played right field for the West Squad. Went 1-for-2 in the game with a run scored and a stolen base ... Ranked among AFL leaders in home runs (3, T6th), RBI (14, T8th), runs (15, T9th), slugging (.486, 10th), on-base percentage (.395, 10th) and total bases (35, T10th) ... Posted three multi-home run games (5/9 vs. Visalia, 5/15 at High Desert & 7/23 vs. San Jose) ... Played for Team Canada who won a gold medal in the PanAm Games. Was on disabled list (5/12-7/31) after fracturing 5th metacarpal on right hand. Included rehab stints with AZL Mariners (R) and Everett (SS-A) ... Hit first career multiple home run game with two vs. Beloit (8/5) ... Hit two grand slams over the course of three days (8/14 at Wisconsin & 8/16 vs. Beloit). Hit first professional home run vs. AZL Brewers (7/10) off Jorge Ortega as part of a 4-for-4 game, establishing his single-game high for hits. 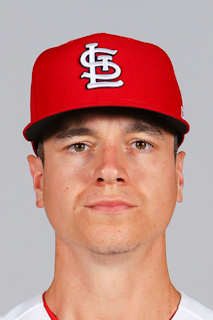 April 23, 2019 St. Louis Cardinals sent LF Tyler O'Neill on a rehab assignment to Springfield Cardinals. April 16, 2019 St. Louis Cardinals placed LF Tyler O'Neill on the 10-day injured list. Right elbow ulnar nerve subluxation. August 14, 2018 St. Louis Cardinals activated LF Tyler O'Neill from the 10-day injured list. August 10, 2018 St. Louis Cardinals sent LF Tyler O'Neill on a rehab assignment to Memphis Redbirds. August 6, 2018 St. Louis Cardinals placed LF Tyler O'Neill on the 10-day disabled list retroactive to August 4, 2018. Inflammation of the groin area. July 31, 2018 St. Louis Cardinals recalled LF Tyler O'Neill from Memphis Redbirds. July 17, 2018 St. Louis Cardinals optioned LF Tyler O'Neill to Memphis Redbirds. July 17, 2018 St. Louis Cardinals reassigned LF Tyler O'Neill to the minor leagues. July 14, 2018 St. Louis Cardinals sent LF Tyler O'Neill on a rehab assignment to Memphis Redbirds. July 5, 2018 St. Louis Cardinals placed LF Tyler O'Neill on the 10-day disabled list. Left groin strain. July 2, 2018 St. Louis Cardinals recalled LF Tyler O'Neill from Memphis Redbirds. May 31, 2018 St. Louis Cardinals optioned LF Tyler O'Neill to Memphis Redbirds. May 18, 2018 St. Louis Cardinals recalled Tyler O'Neill from Memphis Redbirds. April 28, 2018 St. Louis Cardinals optioned LF Tyler O'Neill to Memphis Redbirds. April 19, 2018 St. Louis Cardinals recalled Tyler O'Neill from Memphis Redbirds. March 12, 2018 St. Louis Cardinals optioned RF Tyler O'Neill to Memphis Redbirds. November 20, 2017 St. Louis Cardinals selected the contract of Tyler O'Neill from Memphis Redbirds. July 23, 2017 RF Tyler O'Neill assigned to Memphis Redbirds. July 21, 2017 St. Louis Cardinals traded LHP Marco Gonzales to Seattle Mariners for RF Tyler O'Neill. April 7, 2017 RF Tyler O'Neill assigned to Tacoma Rainiers. April 1, 2017 RF Tyler O'Neill assigned to Tacoma Rainiers. January 30, 2017 Seattle Mariners invited non-roster OF Tyler O'Neill to spring training. April 4, 2016 Tyler O'Neill assigned to Jackson Generals from Bakersfield Blaze. March 6, 2016 OF Tyler O'Neill assigned to Seattle Mariners. April 7, 2015 LF Tyler O'Neill assigned to Bakersfield Blaze from Clinton LumberKings. March 26, 2015 LF Tyler O'Neill assigned to Seattle Mariners. August 4, 2014 LF Tyler O'Neill assigned to Clinton LumberKings from Everett AquaSox. August 1, 2014 LF Tyler O'Neill assigned to Everett AquaSox. July 31, 2014 LF Tyler O'Neill assigned to AZL Mariners. May 12, 2014 Clinton LumberKings placed LF Tyler O'Neill on the 7-day disabled list. April 1, 2014 OF Tyler O'Neill assigned to Clinton LumberKings from Everett AquaSox. September 18, 2013 Everett AquaSox activated OF Tyler O'Neill from the temporarily inactive list. August 12, 2013 OF Tyler O'Neill assigned to Everett AquaSox from AZL Mariners. June 20, 2013 Tyler O'Neill assigned to AZL Mariners. June 12, 2013 Seattle Mariners signed C Tyler O'Neill.